Hope for Haiti is an international development organization that has been working in Haiti for 28 years. Founded by JoAnne Kuehner in 1989, 15 Knights, Dames, and Auxiliary partner with private donors to create community-based sustainable change through a grassroots approach. Hope for Haiti’s vision for the future is creating healthy, sustainable communities. 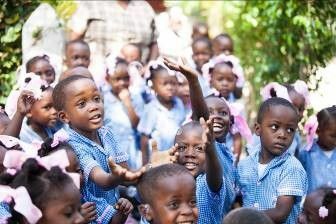 At the core, they are working to improve the lives of the Haitian people, particularly children. Hope for Haiti believes the school—and all of the services that stem from it—are at the center of a healthy, sustainable community. Their approach focuses on five key areas that foster long-term growth and sustainability: 1. Education, 2. Healthcare, 3. Water, 4. Infrastructure, and 5. Economy. Members sort and package medication, coordinate volunteers, package food, perform administrative and clerical tasks, assist with fundraising initiatives, and travel to Haiti to assist with relief missions.